Cooking more meals at home rather than eating out—it’s definitely good for you, right? Well, there’s a new study that says maybe it isn’t always. Ask any health professional and they’ll tell you that one of the most effective things you can do to lose weight is to start cooking more meals. Eating at home gives you control over portion sizes and ingredients and allows you to know exactly what’s going into your food. And a smaller waistline isn’t the only health benefit of a healthy, home-cooked meal. Cooking your own food can also help lower your risk for metabolic syndrome, heart disease, hypertension, and type 2 diabetes. Having said that, there is one critical piece of information missing from the home-cooked meal movement: it matters what you cook. You see I recently read a study that found that the more time middle-aged women spend cooking at home, the more likely they were to have metabolic syndrome, thus increasing their risk for heart disease and diabetes. How did researchers come to this conclusion? The team looked at data it acquired over 15 years, tracking 2,000 women aged 42 to 52. They were each given an annual health exam and asked to complete a questionnaire about their eating and cooking habits. 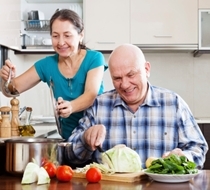 The team then examined how cooking habits related to the markers for metabolic syndrome, which are glucose levels, abdominal obesity, triglycerides, low HDL cholesterol, and hypertension. Having three of those benchmarks qualifies you for metabolic syndrome. Your health all comes down to what you eat, not where it’s consumed. If you’re preparing meals and goodies at home that are filled with sugar, salt, and saturated fat, while neglecting portion sizes, you’re not doing yourself any favors. For example, going to a restaurant for a slice of cake once in a while is far healthier than baking and eating a full cake at home. If part of your health plan this year involves cooking and eating at home more often, make sure you’re using ingredients that promote your goals. Read labels carefully and be aware that sauces—like BBQ sauce or ketchup—are packed full of sugar. To give meat some added flavor, use spices and seasonings instead (just be sure any seasoning mix you’re using isn’t loaded with salt). For fruit and vegetables, focus on purchasing fresh or frozen products, along with whole-grain starch options and healthy fats. These general food guidelines are the best for promoting a healthy weight and limiting the benchmarks of metabolic syndrome. Applehans, B., et al., “Meal preparation and cleanup time and cardiovascular risk over 14 years in the Study of Women’s Health Across the Nation (SWAN),” Preventive Medicine February 2015; 71: 1–6, doi: 10.1016/j.ypmed.2014.11.025. McEwen, M., “Is ‘Cook at Home’ Always Good Health Advice?” NPR web site, January 9, 2015; http://www.npr.org/blogs/thesalt/2015/01/09/376098496/is-cook-at-home-always-good-health-advice?sc=ipad&f=1128.